The focus of our youth work is to support young people through outreach programmes in the local community and at The Spartans Community Football Academy, where we provide a safe place to play, socialise and take part in a range of fun activities. 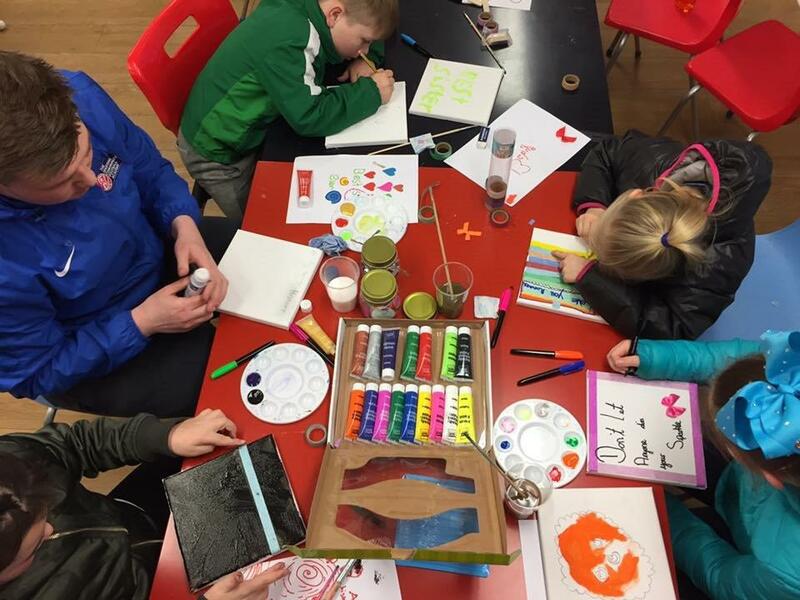 On Thursday and Friday evenings our FooTEA clubs welcome young people aged from 7-15 years. Participants can enjoy multi-sport activities, games or relax and hang out in the youth work space. Everyone gets a nutritious evening meal. FooTEA clubs are delivered by our Youth Work team and are an opportunity for the youth workers to build strong, trusting relationships with local young people. On Thursdays MC FooTEA Club (multi-cultural) welcomes children from a wide range of ethnic and cultural backgrounds.This service acts to signpost children and families towards mainstream youth work and support services that they may not otherwise know about or have previously accessed. Connections Tuesday Club is for young people aged 12-18 years. It is a club for young people with physical and learning challenges. We mix indoor activities such as pool, table tennis, board games and computer games with getting active and playing football on the 5 a-side pitch. Warm snack and cold juice provided. If you’d like to take part please email Garry Betts or Kenny Cameron or call the Academy on 0131 552 7854. The club runs on Tuesdays 4 - 5.30pm. Welcoming Club on Sundays from 1-4pm invites young people from the Syrian Community to take part in sports, games and crafts. The club is for young people aged 10 - 18 years. For more information email Kenny Cameron or call the Academy on 0131 552 7854. Launched by our ambassador Tom Kitchin, in April 2016 young people aged 10-14 years can now have breakfast and take part in fun games and activities on Saturday mornings. This club is targeted at children who receive free school meals during the school week. The club is growing in popularity and now has a regular core of about 15 young people, many of whom are referred by local Head Teachers. Every week over 100 young people enjoy free supervised access to our community football pitch where they can come along and play football in a safe place. Participants sign the 'Players Contract' (designed by the young people who play here) which promotes fair play, good behaviour and a duty of care towards The Academy and the community. During the school year, The Spartans Community Football Academy coaches and youth workers supervise lunchtime and after-school play in local primary schools. Pupils receive structured, quality physical activity sessions and can interact and engage with our staff and are encouraged to come along to The Academy. Our Youth Work team take young people aged from 7-18 years on day trips around Scotland. For many of the participants it may be the first time they have travelled beyond Edinburgh. In 2016 we arranged 14 trips, taking 170 young people to places such as Ryze Trampolining, the Time-Capsule and Hampden Park to watch the national team. Our most recent programme is our Wednesday evening Girls Only Club. This club was developed in response to demand from the girls who attended our Friday FooTEA, who wanted a girls-only environment. Girls aged 11-18 years can socialise and take part in a range of activities from football to facials. In partnership with local charity Hopscotch, we take small groups of young people aged 7-11 years on an annual residential break in rural Scotland. The majority of these children would not otherwise have the opportunity to experience and enjoy a holiday away from home. This committee consists of a group of young people who attend The Academy and an Academy youth worker. Together they share their knowledge and experience of the local area and work to develop and shape what happens at The Academy. The Young People's committee won the prestigious "Inspiring Edinburgh Award" in 2015. Follow this link to fill in our youth work consent form to give permission for a young person to attend our youth work clubs.